I’m not producing many finished pieces in my workshop right now. I’m in a playing phase. I collect materials and make components without any idea of what I am going to do with them. I solder things together, and try different patina formulas and techniques that are new to me. At some point, I’ll plan out a project using what I’ve learned. Sometimes I even make something I like. Maybe. Or maybe I start all over. But since I’m playing and having fun it’s ok. I don’t have to worry too much the cost of materials because I get a lot of them from sidewalks and house sales. When I something interesting that could work as part of a jewelry design I grab it if I can. (Assuming it’s not someone’s hood ornament or something.) I’ve become more selective as my collection has grown which is a good thing. I don’t want to be a mindless collector of domestic detritus and end up on a reality show about hoarding crafters. 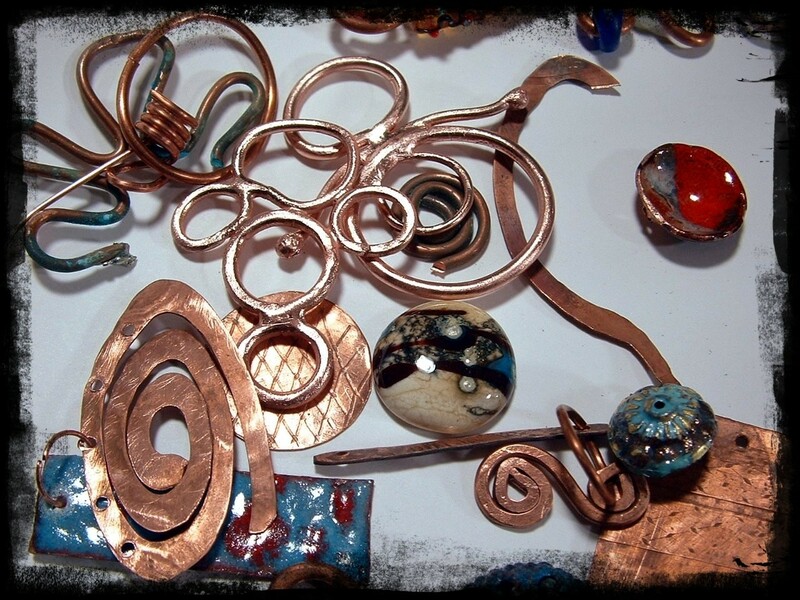 Most of my metal is reclaimed electrical wire, and brass and copper that had previous lives as plumbing or refrigerator parts, kitchen ware and the like. I’ve bought more than one brass tray at a garage sale for next to nothing and used it for jewelry. I understand that this is now the “in” thing to do, but it’s frugal too. That’s why I started doing it. All of a sudden, cars screeched to a to a halt. Dogs stopped barking, children stopped playing. The earth’s rotation stopped (OK, it probably didn’t, but it seemed like it) while I had a flashback to my childhood. Memories of dark churches, smoky incense, tall ornate statues and ill-tempered Nuns in ankle-length habits started flooding my brain. I could hear the ethereal tones of a Gregorian chant off in the distance-and bells. I swear I could hear bells. Let me explain. I suffered through twelve years of Catholic school. That included forced conscription into the annual May Procession, Stations of the Cross, and choir practice. My suffering took on a whole new meaning when I attended church Wilkes Barre Pennsylvania where I had relatives. Wilkes-Barre had been a destination for many Catholic immigrants from Eastern Europe. It seems like there was a church on every corner (What do I mean “seemed? There was a church on every corner) where one could hear Mass in the native tongue be it Ukrainian, Croatian, Slavic, Czech, or any dialect or sub dialect. And there were there touches of scary and exotic (to me) Eastern Europe in the rituals, ceremonies, vestments and church statuary. The immigrants brought their special icons and saints with them-St. Barnabas, St. Olaf – Saints we didn’t read about much at my school where mostly everyone was of Irish descent (and all the boys worshiped the Notre Dame football team; what’s up with that anyway? My husband is Jewish and he sure doesn’t tear up the living room sofa when Brandeis takes the field. Am I missing something?) There was nothing very exotic about my Catholic school in New Jersey- especially after Vatican II. Tedious yes. Painfully tedious. Exotic-no. Going to church in Wilkes Barre was tedious too, but at least the churches were exotic; the relics of ancient tradition and worship were very important in to the immigrant congregations Northeast Pennsylvania. And one of them was the Infant of Prague. The Infant of Prague entered my life when someone gave my cousin an Infant of Prague doll. It sat on a dresser in his room covered in plastic to keep the dust off its lace and brocade robes. The Infant clutched an orb which looked like a softball that someone had stabbed with a crucifix. I was fascinated. But we weren’t allowed to play with the Infant who spent all his time up on the dresser staring at us. 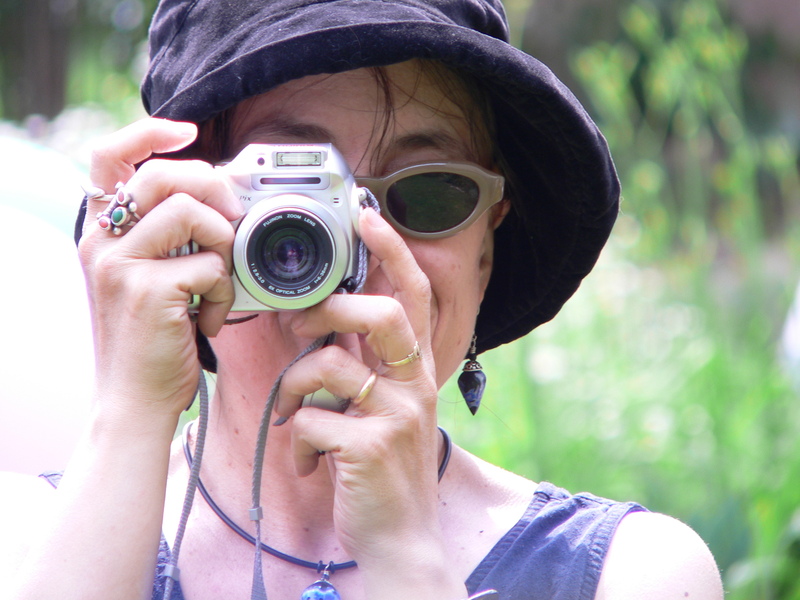 It was only when I reached adulthood that I released he was spying for my Grandmother. I always wanted pry the orb from the Infant’s hand and try to roll it across the floor like a bowling ball. I never did, but it was tempting. To this day I am certain that if I had done so, I would have gone straight to hell when I died. It was only the likelihood of my Grandmother creating a hell on earth for me if I got caught that saved my mortal soul. Maybe. We were Catholic after all and as that famous Catholic George Carlin said, “It was a sin to wanna.” And I sure did wanna. 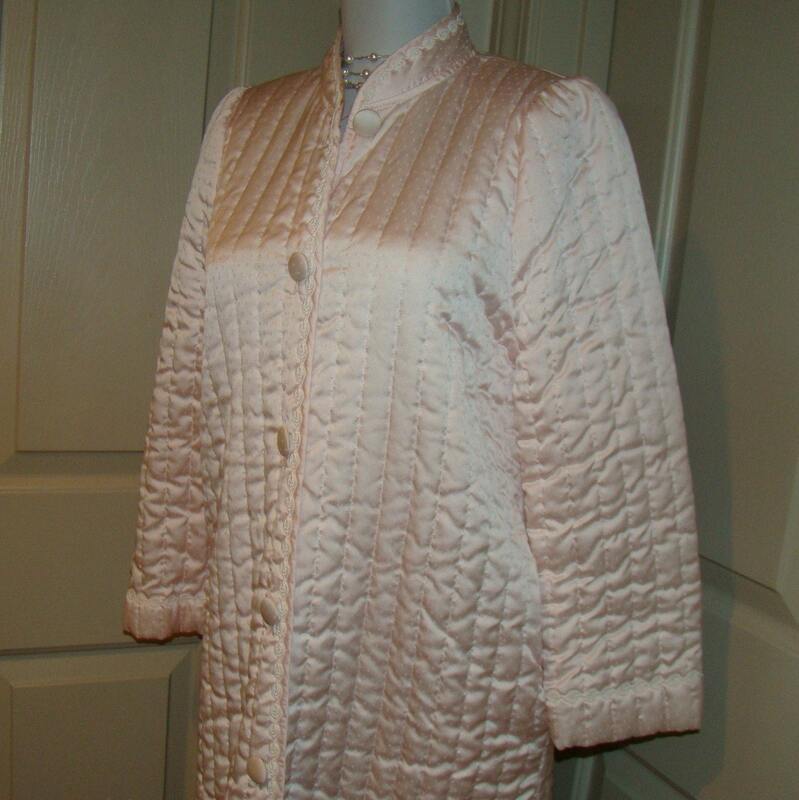 When my niece was about three, one of her grandmothers gave her a quilted nylon bathrobe that came down to her ankles. You know-the kind you wear on Christmas morning and take to the hospital when you have your tonsils out. When she first put it, on I burst out laughing because she reminded me of the Infant of Prague. 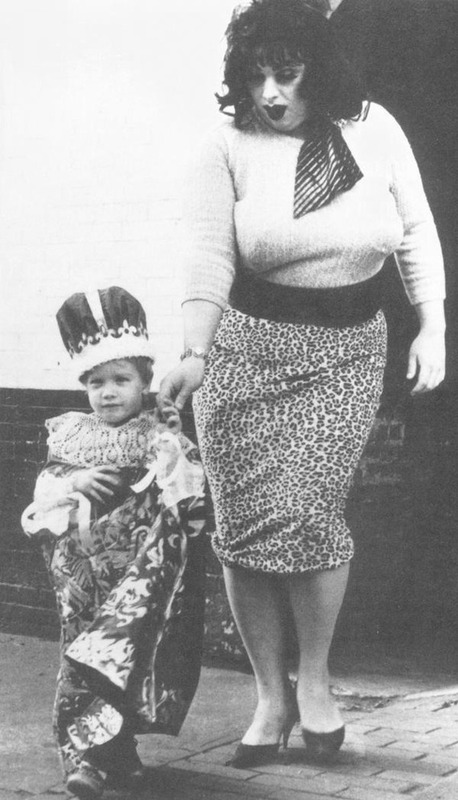 (The John Waters version from his movie Multiple Maniacs.) I shared my opinion with her parents and maybe that’s the reason I was never-never mind. By now you must be wondering what this has to do with inspiration and making jewelry. That must mean that we have reached the end of the flashback and need to get back to the flea market to see what happens next. “Sold American!” I hooted, fishing two quarters out of my pocketbook. I took my prize home and tried to put it on the cat’s head and take his picture, but Plumpton was having none of it. The Infant’s crown now sits on the top shelf of my jeweler’s bench. I think it’s brass. 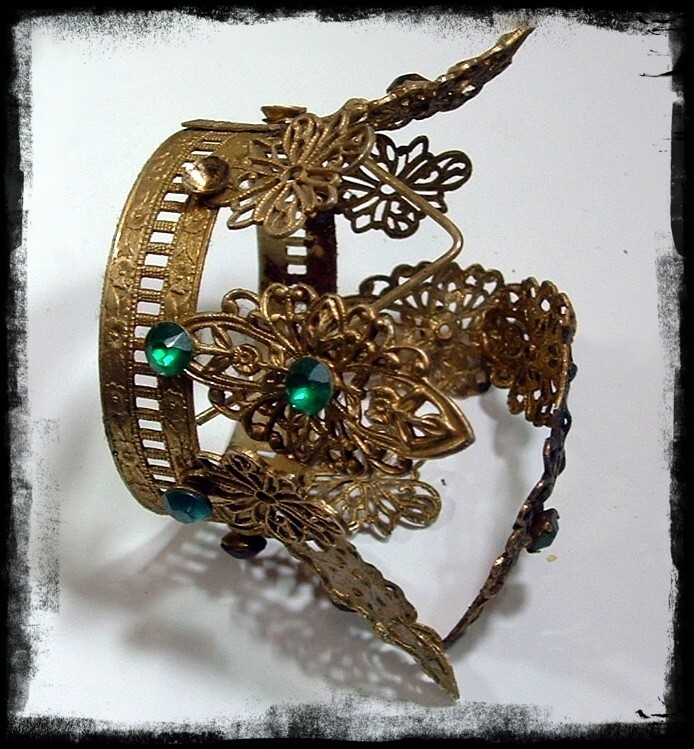 I’ve already used one of the pieces as part of an embellishment. But since it is the crown of the Infant of Prague, I can’t waste it on just anything. So there it sits waiting for the right project. I wanted to make something special for my two-year-old Step Potato who was expecting a little brother. When you’ve been the only kid for two years, an addition to the family can take some adjustment. And what happens if you need some attention at night but Mom or Dad can’t get to you right away because Baby Brother is wailing in his bassinet? I knew Step Potato was going to need a friend he could lean on during those tough times. After thinking it over, I decided Step Potato could use a scary looking monster who would be a loyal friend, assistant and protector. The monster also had to be soft and throwable. Most importantly, Step Potato needed an experienced monster who could deal with the sort of despicable creatures who live under children’s beds at night and who could watch over him as he slept. That was how I decided to make J. Monster Baskin. When the going gets tough, the tough get sewing. I took a wool sweater and felted it in the washing machine. It was nice and soft. Monster ready. So, I had my material, but what kind of monster? The monster had yet to emerge. 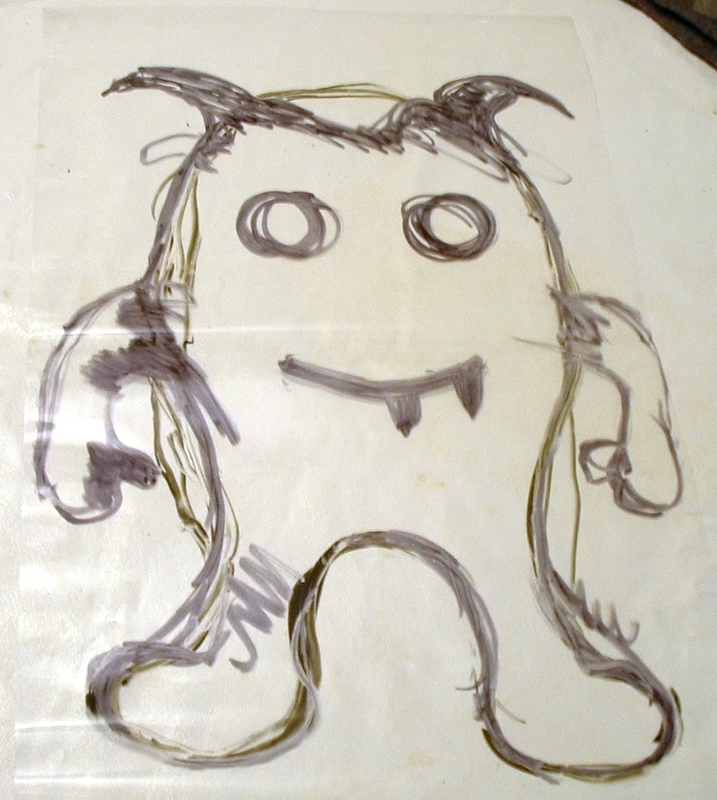 I got a piece of heavy plastic, drew a monster pattern on it with a marker and cut it out. This was a very slap dash process as the pictures show, but the creature was starting to make himself known. 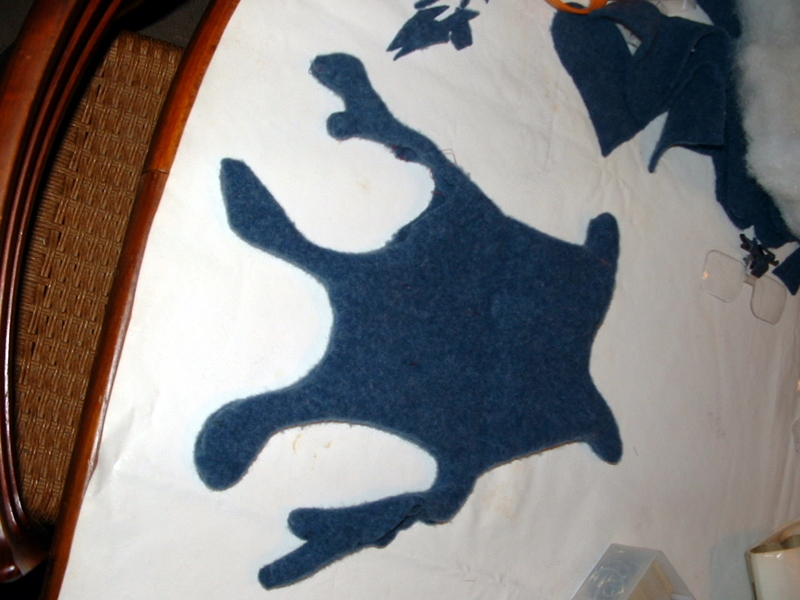 I cut two identical monster shapes out of the felt and pinned them together in preparation for sewing. That’s when the complaining started. 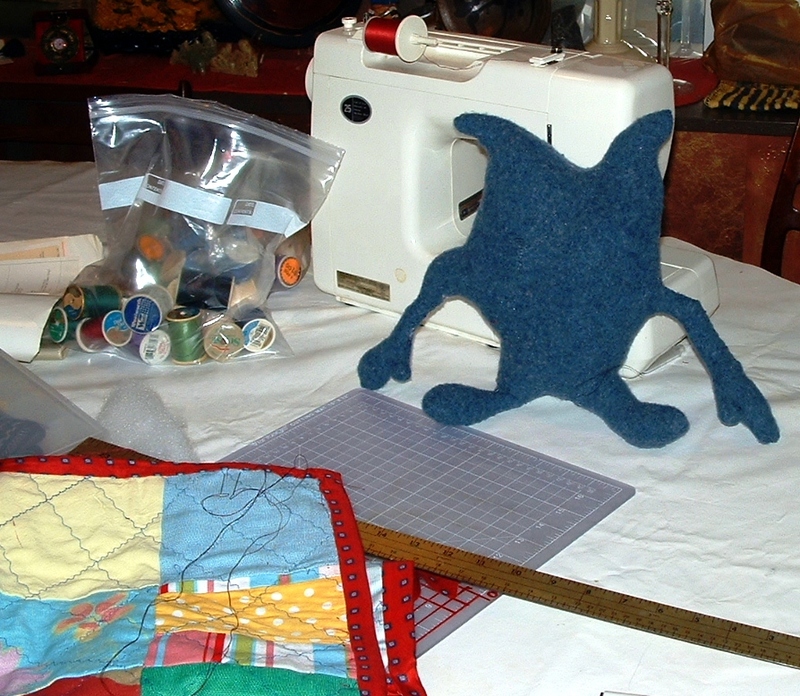 I think I heard him sob a little as I sewed him up. I was determined to sew him right the first time so I would not have to resort to the seam ripper. Stuffed monsters put seam rippers in the came category as Medieval instruments of torture. I do have some compassion. Now he looked like J. Monster Baskin. I started to stuff him with fiberfill. He didn’t make it easy. “Oof, Oof,” J. Monster groaned like a linebacker. “Wait! Yowl, he screamed, “Watch where you’re putting your fingers, lady!” J. Monster warned me as I poked fiberfill through a hole I left in his side. I thought I saw him blush. “Hey! That tickles-Watch what you’re doing! What’s that? Ha! Ha! You’re killing me Stop, stop! ” J. Monster got the giggles and started racing around the table. Whenever I tried to grab him he would wriggle out of my grasp. I was getting exasperated. “Quit it, come back here, lie down and let me finish!” I ordered him, “Unless you want to be some pigeon’s girlfriend,” I added. He sobered up fast and came back muttering under his breath. But he let me finish stuffing him. 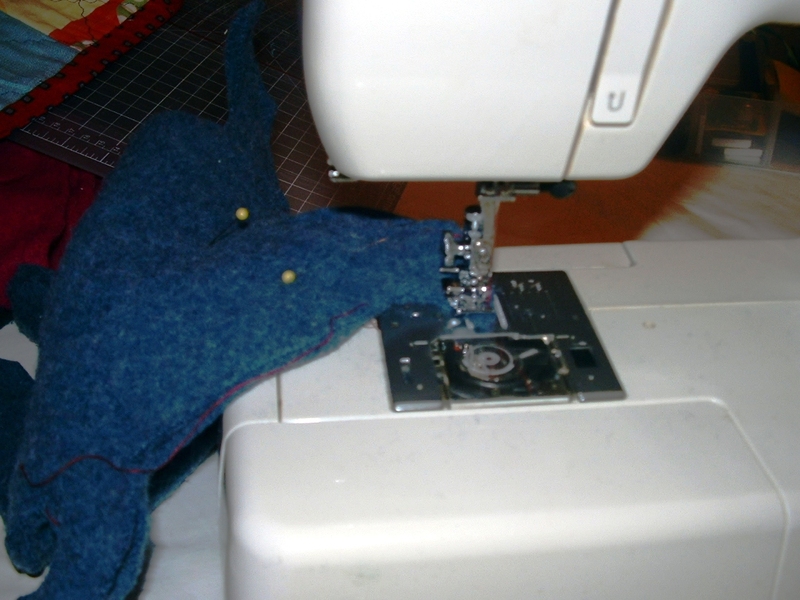 I hand sewed J. Monster’s last seams. He was very brave this time and didn’t cry at all. Now, anyone who has ever seen a Western knows that removing the bullet is much more painful than being sewn up. Still, I thought J. Monster endured the procedure well; quite an accomplishment for a young monster. But J. Monster was panting. I thought I should let him rest after his ordeal and left him sitting by the sewing machine while I went to have dinner. J. Monster didn’t know I was in the next room because he didn’t have eyes and he couldn’t smell dinner because he didn’t have a nose. So how could he talk? He didn’t have a mouth either. Maybe you can tell me. 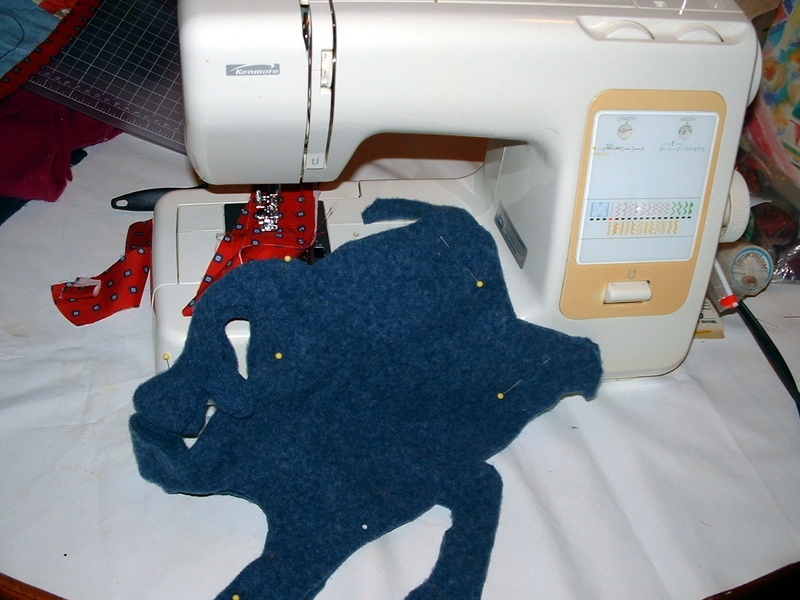 I returned after dinner and fashioned a nose for J. Monster from a piece of stuffed felt and sewed it on. 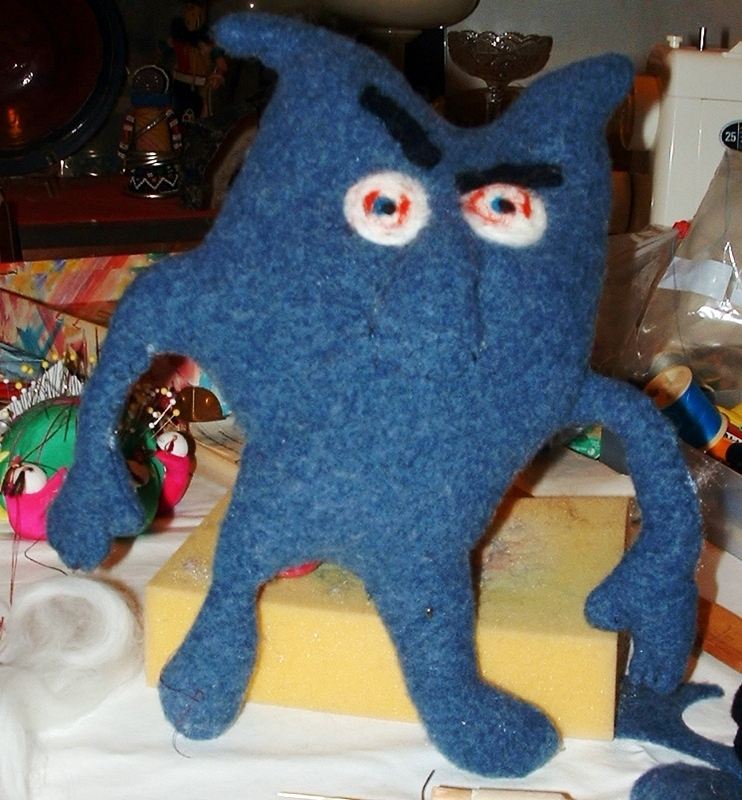 Then I needle felted him some bloodshot eyes and a pair of monstrous eyebrows. “So it was you all along!” he said looking at me accusingly,” It was you the whole time! 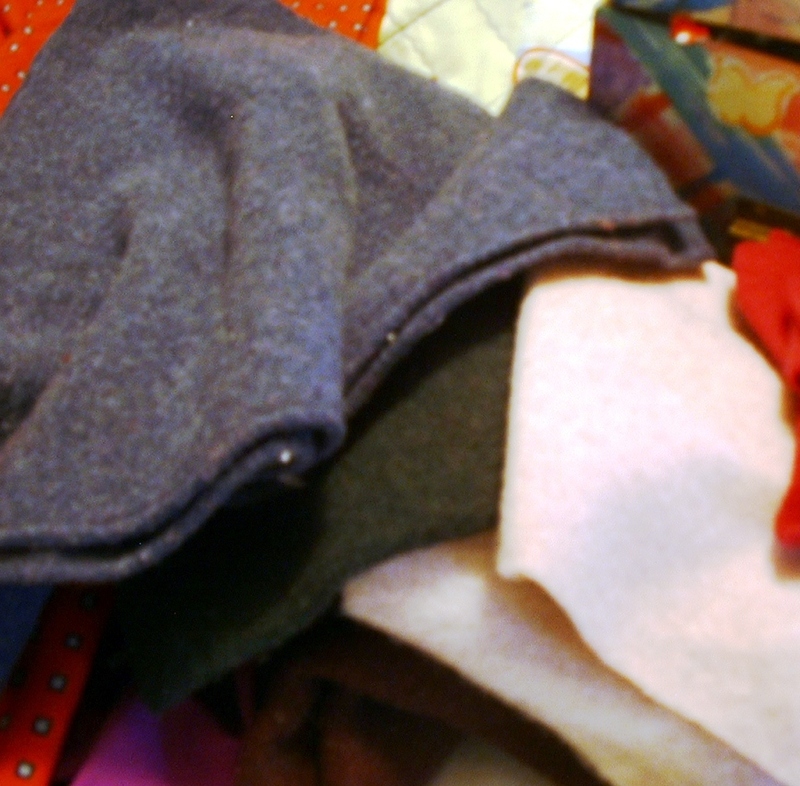 Why I oughta. . .” I started to feel a bit apprehensive, but then he seemed to forget all about the pinning, sewing and stuffing. 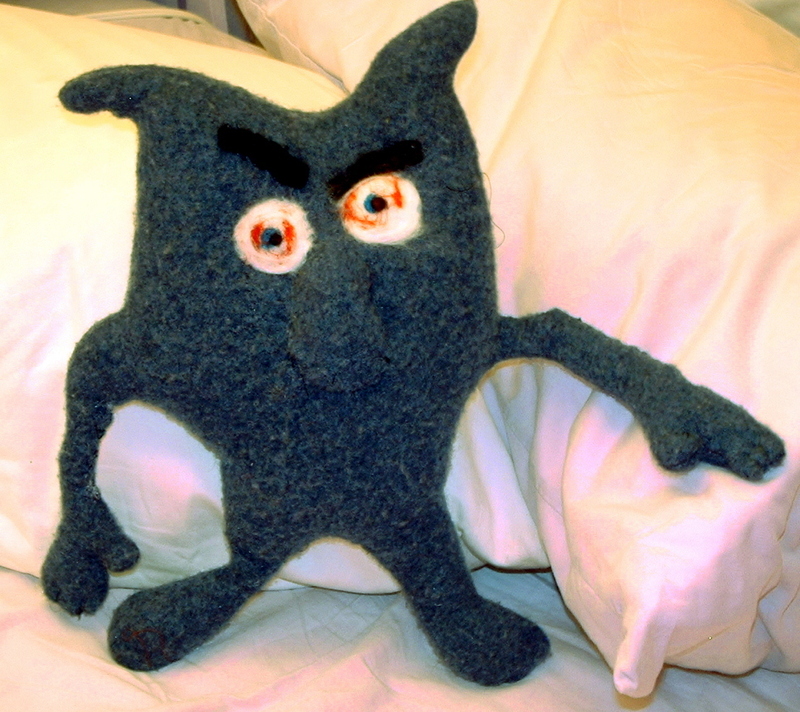 Stuffed monsters don’t have very good memories you know. “Where’s the kid? he demanded. “He lives with his parents in another town,” I explained. “I drive. We go now!” He hopped off the table and scampered for the door. Finally the day of departure came and I carried J. Monster to the car. We finally arrived and I delivered J. Monster Baskin into the arms of the Step Potato. He hugged his monster, then promptly threw him against the dining room wall. I thought I heard J. Monster Baskin sigh contentedly. And would you believe that J. Monster has not said a word since? At least not to me. 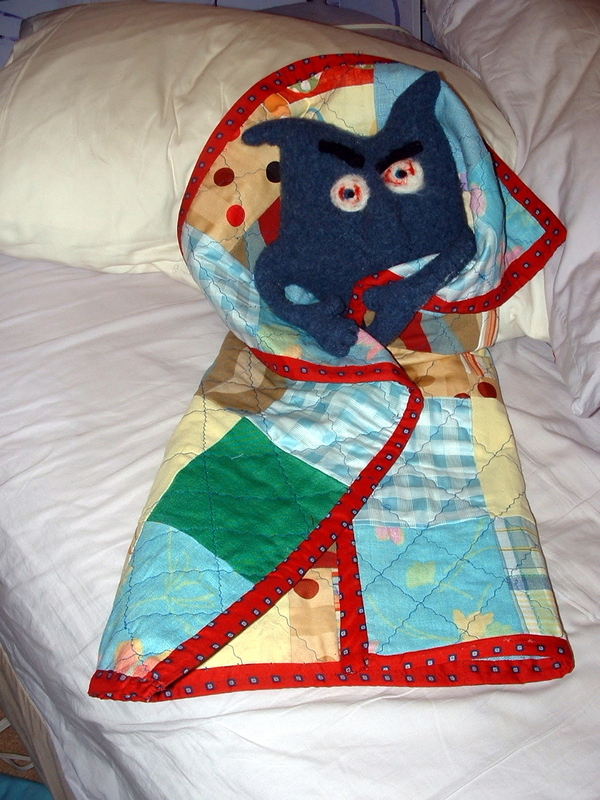 Monster waiting impatiently to leave for the Step Potato’s house wrapped in the baby quilt. I will post the story of the baby quilt next week.